The world over, Shell sells more than 17 million metric tons of petrochemicals each year. When Shell Polymers announced it would be building a major petrochemical complex near Pittsburgh, Pa., it chose the location for its accessibility and proximity to customers. 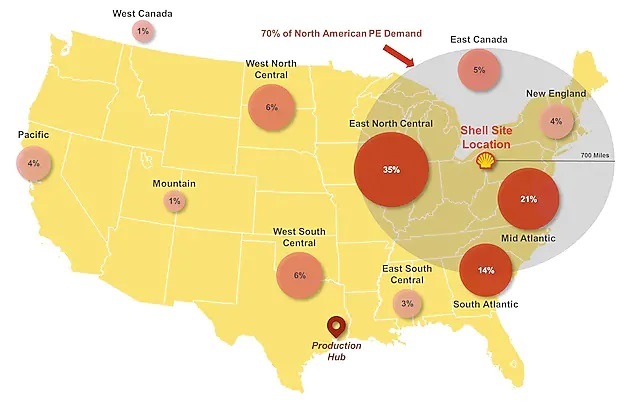 In addition to the Pennsylvania Petrochemicals Complex’s closeness to shale gas producers in the Marcellus and Utica basins, more than 70 percent of North American polyethylene customers are located within a 700-mile radius of Pittsburgh. 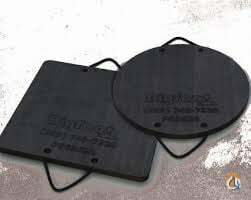 These customers produce a variety of products using polyethylene, including packaging, sports equipment, construction materials, automotive fuel tanks, and toys. The delivery of polyethylene from Pittsburgh provides them with a shorter, more direct supply chain, compared to sources on the Gulf Coast. Shell’s complex is being constructed on the banks of the Ohio River in Monaca, Pa. After the site was prepped, construction started in November 2017. Since then, the 400-acre project site has amassed more than 100 pieces of equipment, including cranes, forklifts, backhoes, and excavators, and nearly 3,000 workers. An additional 3,000 are expected to join the project before construction ends. 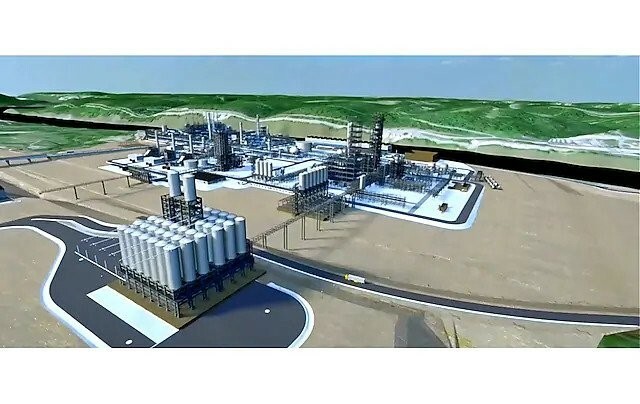 With completion pegged for 2021, the Pennsylvania Petrochemicals Complex will feature four processing units, including an ethane cracker and three polyethylene units. Shell’s campus also will house a 250-megawatt, natural gas-fired power plant to produce electricity and steam to run the cracker plant, as well as an innovation center that will include analytical and testing labs. The facility is expected to employ 600 employees and produce 1.6 million tonnes of polyethylene per year. One of the first vertical pieces to be erected on site was a 285-foot-tall quench tower—the largest piece of equipment at the Pennsylvania Petrochemicals Complex. Last spring, Shell moved the quench tower to the construction site. The 2,000-tonnes, 87-meters-tall tower was fabricated in Mexico, shipped to Houston, then it spent three weeks being towed by barge up the Mississippi and Ohio rivers to the site. Once it arrived in June 2018, it was offloaded at a dock and transported down a newly created road. 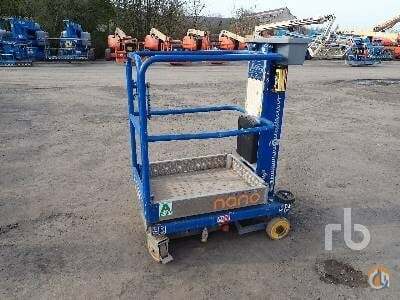 Both the dock and road were specially designed to handle the large quench tower. Mammoet supplied its MSG80 ring crane for the critical lift. The MSG80 is one of the largest cranes in the world, providing a long reach and flexible configuration when lifting oversized, heavy objects. A Shell spokesperson said the crane had to be reserved a year in advance of the lift, and it took six weeks to set up the crane for the single lift. The MSG80’s maximum lifting capacity is 3,073 metric tons. At its maximum lifting height of 94 meters, the maximum lifting capacity is about 1,460 metric tons at a 38-meter radius. 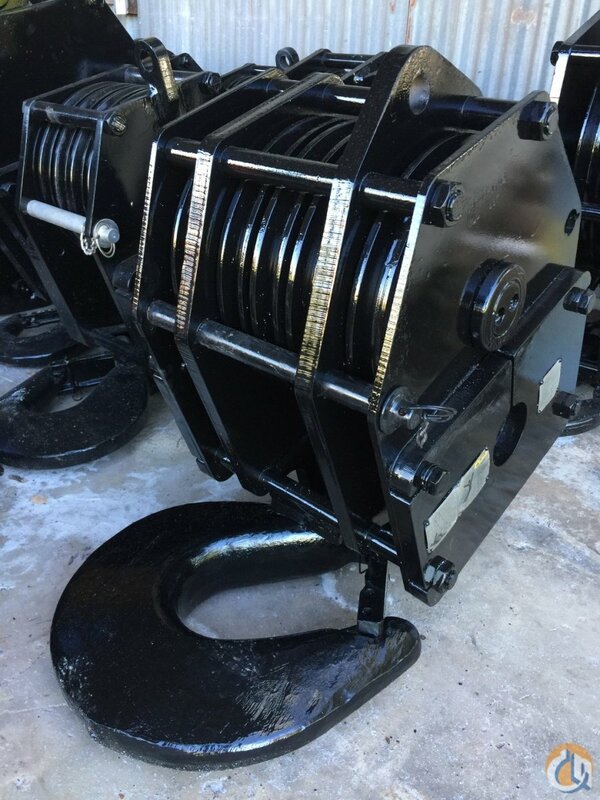 With the addition of a 26.2-meter jib, the maximum capacity is about 1,690 metric tons at a 38-meter radius. 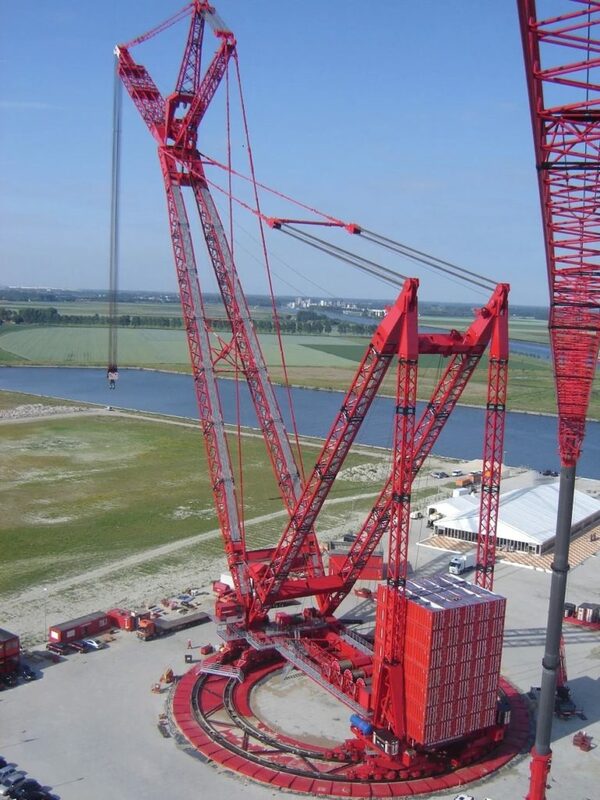 According to Mammoet, the crane was selected because it offered a small footprint that fit the restricted work area but offered enough capacity to complete the lift. Erecting the quench tower took about 12 hours to complete. Once the quench tower is in operation at the plant, water circulating through the quench tower will cool down cracked gas, condense heavy hydrocarbons, and remove coke and tar particles. The tower is energy-efficient because it transfers heat absorbed by the circulating water for use in other parts of the plant. The MSG80 isn’t the biggest crane on the project. The other massive machine is Mammoet’s PTC 200 DS heavy lift crane, which is scheduled to complete 45 additional lifts on the project, including modules, silos, structural steel assemblies, and other large materials. 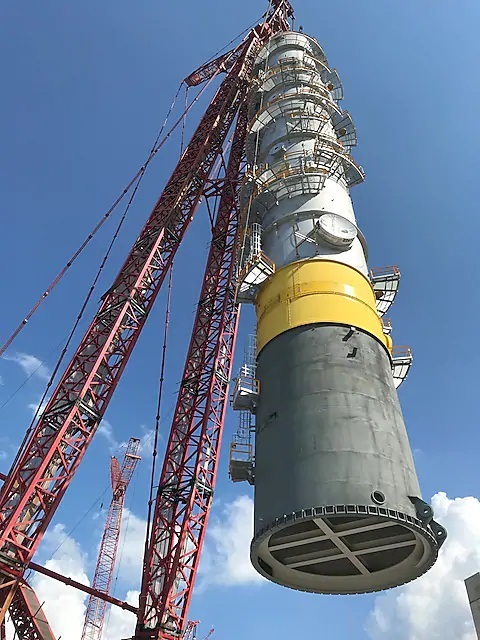 In December 2018, the PTC 200 DS was used to install the site’s polyethylene slurry loop reactor, which will be used to make high-density polyethylene. 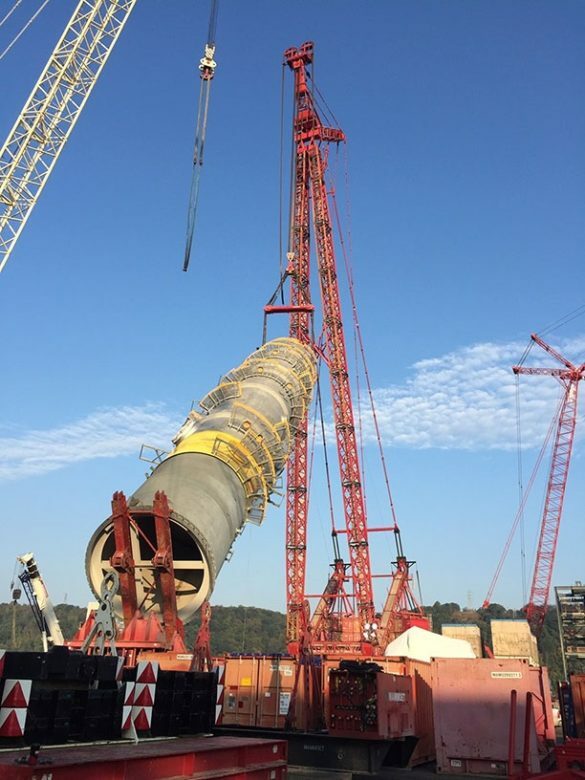 In addition to the Mammoet cranes on the project, ALL Crane Rental of Pennsylvania, a member of the ALL Family of Companies, noted on its Facebook page it has delivered close to 90 percent of the cranes being used to construct Shell’s Pennsylvania Petrochemicals Complex. Happy Valentine's Day! As our gift we thought we would share our latest milestone. Enjoy! Another lifting feat at the construction site was when the roof of an 8-million-gallon ethylene storage tank was installed using air pressure. The 80-foot-tall tank was first constructed, then crews assembled the roof on the outside of the tank. Using three large fans inside the tank, the air pressure was increased to 0.2 psi. Once air pressure reached the required level, the roof began ascending on its own. After about 1.5 hours, the roof’s ascension was complete and welded in place by workers. According to a Shell spokesperson, the process isn’t unique to the industry, but it had been eight years since Shell performed this type of roof lift.